Amid launch rumors that Apple is preparing to release the AirPower sometime soon, the Cupertino company has finally secured the rights to the AirPower trademark. To get the AirPower trademark, Apple had to jump through quite a few hoops over the course of the last few months, ultimately seeming to purchase access from a company that had previously applied for the trademark. Apple first attempted to trademark the AirPower name in the summer of 2018, but found that a company named Advanced Access Technologies had filed an earlier application to trademark the term. The AirPower trademark registered by Advanced Access Technologies was then provisionally granted and published for opposition in December 2018. Ahead of when a trademark is officially granted, the USPTO takes opposition filings from anyone who believes the trademark could result in confusion with an existing product. 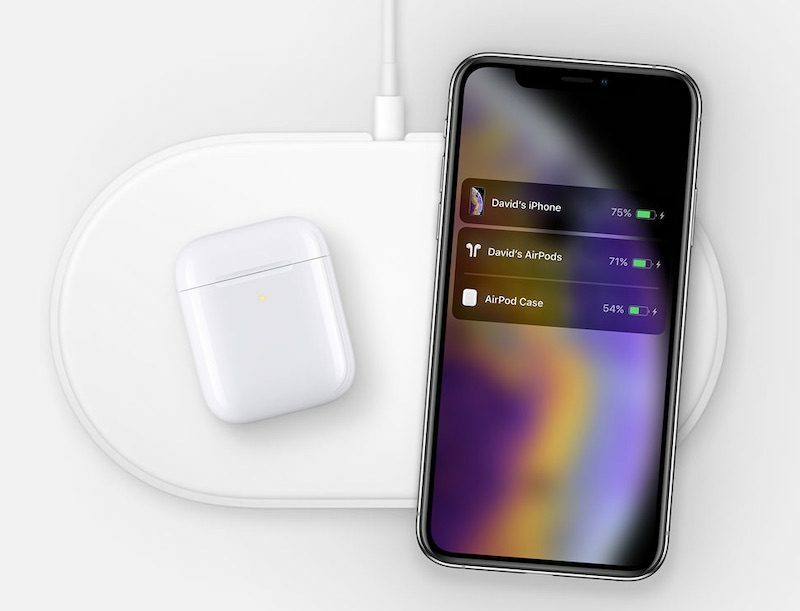 Apple opposed Advanced Access Technologies' trademark of AirPower in January 2019, claiming that it would interfere with similar trademarked Apple product names, including AirPlay, AirPort, AirPods, and AirPrint. After fighting to prevent the AirPower trademark from being granted to Advanced Access Technologies for several months with multiple different filings with the USPTO, Apple yesterday suddenly withdrew its opposition and the dispute was terminated. 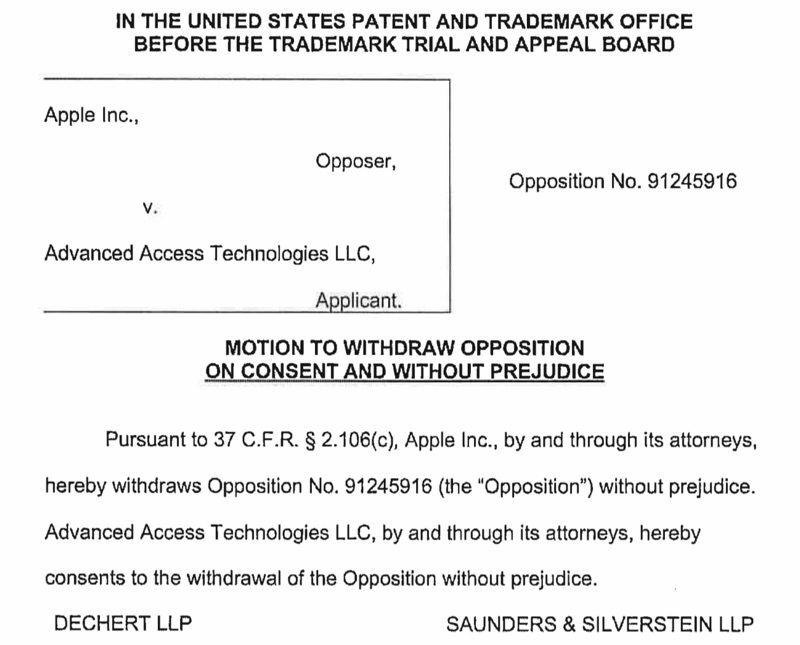 Just after Apple withdrew opposition on Advanced Access Technologies' trademark of the AirPower name, an Apple lawyer was appointed the attorney of the trademark case, suggesting that Apple purchased rights to the AirPower trademark from Advanced Access Technologies ahead of an imminent AirPower launch that would not give Apple time to secure the trademark through other means. 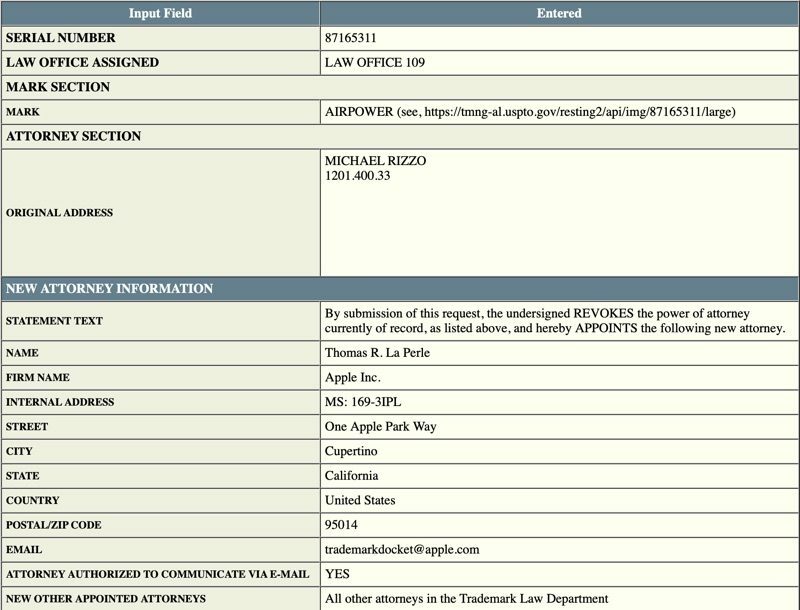 Advanced Access Technologies is still listed as the owner of the trademark, but Apple appears to be in the process of getting that changed, with Apple lawyer Thomas Perle now named as the attorney on the trademark application. Apple's acquisition of the AirPower trademark comes amid new rumors suggesting a launch for the long-delayed accessory isn't too far off. There's new code in the iOS 12.2 beta related to charging multiple devices at once, which wasn't there before, indicating Apple may be planning to release the AirPower sometime around when iOS 12.2 comes out. The Wall Street Journal recently confirmed that Apple approved production of the AirPower earlier this year, and just today, we found an image of the AirPower with an iPhone XS and the new AirPods Wireless Charging Case hidden in the source code on Apple's website in Australia. It's still not clear when the AirPower is actually going to launch, but with increasing signs of its arrival, it could come at any time. Apple this week released new iPads, iMacs, and updated AirPods on Monday, Tuesday, and Wednesday, leading to speculation the company was gearing up to introduce the AirPower, but there's still no sign of the device. We could potentially hear word on when we can expect the AirPower at Apple's March event, which will take place next Monday. Apple is using the event to introduce a new Apple News service and streaming TV service. Rumors have, however, suggested the event will not focus on hardware, so we could be waiting until later in the spring for an AirPower update. Update: According to a new document filed with the USPTO on March 22, [PDF], the AirPower trademark has indeed been transferred to Apple. Glad they are finally getting it out. Let’s hope it isn’t priced out of the market. Although, there is no other charging pad that will do what it does for iOS ecosystem devices. So much drama over this product. A pretty specious claim, in my opinion. Does Apple think that every name starting "AirP" rightfully belongs to them for this reason, even if another company already has the legal rights? Advanced Access Technologies could use the same argument to claim that Apple shouldn't have the AirPlay, AirPort, AirPods, and AirPrint trademarks because they would interfere with its "AirPower" name. So Apple announces in September 2017 but doesn't apply for the trademark until Summer 2018? Forgive my ignorance but is this standard practice? AirPower probably uses Lightning connector. We’ll see. No mention of charging the Watch though. I'm surprised and disappointed that the Watch can't be charged on any Qi charger. Poor choice by Apple, but I'm sure they had a reason. Apple trying to steal the name airpower. I'm not surprised. Apple stole the apple name from the Beatles. It's in Apple's dna to steal. Why are you here if you feel that way? They weren't trying to steal it. It's the name they wanted and they made efforts to legally secure the name. No stealing was involved. Had they launched the product with that name, and didn't have the rights to it, that would be different. I’m thinking many thought Apple couldn’t straighten out the technology. Somebody is likely VERY rich as a result of this, and they probably had no plans to create a product. They simply owned the Trademark. I'm off to register "Air*" (that asterisk is a wildcard, so it covers everything!). Apple is gonna owe me big time!! Mainly by sites like this has been exercising the drama. Everywhere else, no one even knows what the Airpower is. But none the less, it’s probably better that Apple didn’t release this if it was experiencing manufacturing concerns early on and would rather have it delayed to get it right the first time.